If you're interested in academic research papers, read our journal. Rosten’s anecdote confirms how common question-asking is in the Jewish-American dialect; after the introduction of Yiddish into American English, people came to recognize this syntactical pattern as a distinctly Jewish trait. Even more interesting is Rosten’s placing the joke in the section of his book which attempts to define the difference between a “goy” and a “Jew.” Rosten clearly sees question-asking as a conspicuous way of distinguishing between Jews and Gentiles. But besides noting that the pattern of question-asking is typical to Jewish speech, not much more has been made of this phenomenon. Never has this linguistic pattern been linked to or placed in a discussion of American musical theater, a field dominated by Jews. In the first half of the twentieth century, Broadway was pioneered largely by Jewish composers and lyricists, and it was Jewish writers, most specifically, who created this definition of America on the American stage for musical theater audiences. The theater attracted Jewish writers. It may seem paradoxical, but it took a Russian-born cantor’s son, Irving Berlin, to write “God Bless America” and the musical of quintessential Americana, Annie Get Your Gun. It was Jerome Kern and Oscar Hammerstein II, both Jews, who wrote the American masterpiece Show Boat. George and Ira Gershwin composed Porgy and Bess, often considered America’s first and best opera. Richard Rodgers and Oscar Hammerstein II created and defined aspects of the American landscape in Oklahoma! and explored American values in South Pacific. And, in the latter half of the twentieth century, Jerry Bock and Sheldon Harnick wrote the prototypical “Jewish” musical, Fiddler on the Roof. The composers and lyricists I focus on here were either born in Eastern Europe, came from immigrant families newly arrived in America, or were native to a society where Jews were outcasts. It is not a coincidence, then, that these “non-Americans” were the ones who clearly saw the American landscape and who considered America a worthwhile topic to sing about on stage. To study these writers as a group, it is necessary to illuminate some of the commonalities shared by the Jewish composers and lyricists. This paper will discuss a specific trait that all these Jewish lyricists had in common: their linguistic heritage of Yiddish and how that legacy formed the lyrics that pioneered the American musical stage. Irving Berlin, Ira Gershwin, Oscar Hammerstein II, and Sheldon Harnick all spoke and wrote in English throughout their careers. But what is more important is that they came from Jewish backgrounds in which Yiddish had an enormous influence. There is a very distinctive element in their collective work, one that has unquestionable ties to their Jewish culture and which is all but absent in the work of their Gentile counterparts. It is the simple syntactical form of asking a question, instead of making a direct statement. Especially in the new world of America, audiences began to understand this syntax as a specifically “Jewish” way of using language. It is important to understand that the Yiddish texts did not preach exclusion. The publications were not intended as a tool for the Jewish community to isolate itself but as an in-road to assimilation. Numerous publications “became famous for the beauty of their work and the particularly modern American view of life they held out. The Yiddish newspapers and magazines were, as a rule, openly in favor of assimilation to the American way of life and had no scruples about freely admitting into Yiddish all types of Anglicisms,” Steinmetz states. This linguistic exchange was mutual; Yiddish became affected by American English, and the reciprocal occurred. We know that numerous Yiddish words became part of the English vernacular, but it is not only Yiddish vocabulary that changed the American landscape. The Yiddish heritage of the Jewish lyricists affected the songs they wrote and changed American musical theater as well. My child, who will comb and caress you? My child, who will clean your cradle? Without a mother, there is no comfort! My child, who will clothe and adorn you? My child, who will take you to cheder? My child, who will make a man out of you? My child, who will bless you under the canopy? And bear the shameful chain? For him, who robs you of your bread? The questioning, searching and skeptical man is not excluded from the circle of believers; he becomes, rather, the spokesman of the central work of the Jewish religion, the prime source for halakhah [traditional Jewish law] and daily conduct. This very process creates the unique blend of profound faith and questioning skepticism that has characterized the Jewish people throughout the ages. The lyricists I discuss here were quite comfortable with question-asking as a core part of their discourse. Beyond the nuances of their everyday conversation, they were taught in both their formal Jewish instruction and in their casual contact with Jewish adults that they could reach the most profound truths through questions. By doubting all assumptions, and analyzing the world they lived in, they could create a new set of truths for themselves. There is no question that the lyricists I discuss were familiar with and influenced by the nuances of Yiddish. For Irving Berlin and Ira Gershwin, Yiddish was the language of their first neighborhoods and certainly of the home. Even for Oscar Hammerstein II and Sheldon Harnick, who did not grow up in the tenements of New York, Yiddish would have been deeply ingrained in their psyches and in their ears, simply from their families and social circles’ knowledge and usage of it. Each of these lyricists uses the pattern of question-asking. But it is important first to understand the pattern in general terms to provide a context for the specific examples. Though all of these examples illustrate the question form, the Jewish lyricists employ variations of the same pattern. Declares he’s pleased with me; what does he mean? What does he know of me, this Lord and Master? When he has looked at me, what has he seen? But how do you make her stay, and listen to all you say? How do you keep a wave upon the sand? Oh, how do you solve a problem like Maria? How do you hold a moonbeam in your hand? In these examples, Hammerstein leaves his questions unanswered either because there is no answer, or because the character singing lacks the power to obtain it. Tuptim, the slave, will never know what the King thinks of her or means when he speaks about her because he leaves her in ignorance. The nuns, who exasperatedly sing about Maria, cannot answer these questions. They find that this rhetoric is the only way they can explain the free-spirited nonconformity of their new novice. This is the exact point. Hammerstein uses this very Judaic pattern to pose questions for examination, leaving the audience to understand that at times, questions do not have answers. In other examples, the Jewish lyricists create a list of questions, and then answer them with a small but definitive word, phrase or sentence. This is a particularly effective technique; that final “answer” packs a large punch, providing closure to the song. Therefore, the character does find some answer to the question, brief though it may be. What is the good of being by myself? Why was I born? Why am I living? What do I get? What am I giving? Why do I want a thing I daren’t hope for? What can I hope for? I wish I knew. Why do I try to draw you near me? Why do I cry? You never hear me. I’m a poor fool, but what can I do? Why was I born? To love you. Shall I join with other nations in alliance? If allies are weak, am I not best alone? Might they not protect me out of all I own? Is there danger to be trusting one another? One would seldom wants to do what other wishes. They’ll be nothing left on earth, excepting fishes! Other than to recognize that they stem from Yiddish syntax, it is difficult to pinpoint why these language patterns exist in the Jewish vernacular, but there is no question that they do. The pattern of asking questions appears time and again as a standard lyrical form for Jewish songwriters, too many times to be ignored or disregarded as “unscientific.” Further, it is telling to consider the differences between Jewish and non-Jewish lyricists. Let us do a brief comparison of the Jewish lyricists’ work to the songs of their most prominent non-Jewish colleagues, Cole Porter and George M. Cohan. Often dines me at the Ritz. Mr. Fritz invented Schlitz, and Schlitz must pay. Yes, I’m always true to you, darling, in my way. That I will soon be there! So prepare, say a prayer, spread the word to beware! On a bright cloud of music, shall we fly? And shall you be my new romance? Shall we dance, shall we dance, shall we dance? If the reader knows this scene in The King and I, he remembers that the action, not the lyric, answers this series of questions, since Anna and the King actually polka around the hall as they sing this song. The scene would seem absurd if the lyrics were written in a statement form, since they would stupidly state the obvious. “We shall dance/On a bright cloud of music, we shall fly” would not form the magical scene that Hammerstein otherwise creates. Let’s do it; let’s fall in love. In the first few decades of the twentieth century, the distinction between the Jewish lyricist writing question-songs and the Gentile writing statement-songs was clear. It must be admitted, however, that this was not a longtime trend. These innovators knew each other and studied each other’s compositions to learn what became successful and popular. Soon enough, they began to imitate each other’s patterns, and the distinction became blurred. Evidence of this change again lies in careful study of Cole Porter. From the time Porter began publishing music with the song “Bridget” in 1910, and for twenty years following, all but three songs he published were statement-songs. However, in his later years, after watching the question-song flourish on Broadway, Porter regularly tried the form himself. In the second half of his career, Porter averaged at least one question-song per show, including: “What Shall I Do?” (1938), “Do I Love You?” and “Well, Did You Evah?” (1939), “Who Would Have Dreamed?” (1940), “Could It Be You?” (1941), “Should I Tell You I Love You?” (1946), “Why Can’t You Behave?” and “Where Is the Life that Late I Led?” (1948). Why, oh, why do I love Paris? To an even greater detriment, Porter’s lyric of “Why, oh, why?” seems to be a direct appropriation of E.Y. (Yip) Harburg’s lyric in The Wizard of Oz. Harburg, a Jewish lyricist collaborating with Harold Arlen, wrote this phrase in 1939, fourteen years earlier, in “Somewhere Over the Rainbow:” “Birds fly over the rainbow/ Why, oh, why can’t I?” There is no question that Porter’s “I Love Paris” has a hauntingly beautiful and memorable tune. But under deeper scrutiny, Porter’s lyrical attempt to imitate his Jewish colleagues, indeed to write “good Jewish music,” seems just that: an imitation. Porter wrote no more question songs after this attempt in 1953. It must be said that the Jewish lyricists also transitioned into writing statement-songs. Even though Irving Berlin wrote question-songs throughout his entire career, some of his most famous lyrics segue to use the basic subject/verb syntax of the statement song; consider his “This Is the Army, Mr. Jones” (1942), and Annie Get Your Gun’s “I Got the Sun in the Morning” and “There’s No Business Like Show Business” (1946). Some of Ira Gershwin’s statement songs became his biggest hits: “I Can’t Get Started” (1935), “Let’s Call the Whole Thing Off” (1937), and the final song he and George wrote together, “Love Is Here to Stay” (1938). 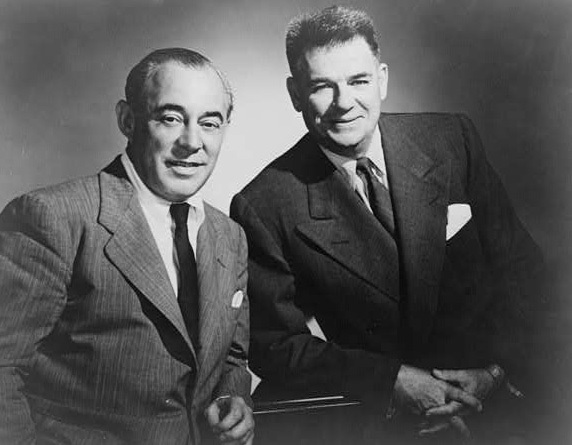 Finally, the Rodgers and Hammerstein partnership created a list of very famous statement songs, including: “I Cain’t Say No” (1943), “You’ll Never Walk Alone” (1945), “I’m Gonna Wash That Man Right Outa My Hair” (1949), and “Climb Ev’ry Mountain” (1959). Despite this ultimate blending of forms, the pattern had been set. Stemming directly from their Yiddish heritage, the Jewish songwriters introduced the question-song to Broadway, and its success turned the question-song into a standard. Proof of this lies in an analysis of the most famous “Jewish” musical ever written, Fiddler on the Roof. Besides being written by a Jewish composer and lyricist, Jerry Bock and Sheldon Harnick, Fiddler has a distinctly Jewish plot. Based on the stories of Yiddish author Sholom Aleichem, the story follows the residents of the Jewish shetl of Anatevka, who live in constant fear of pogroms. Unlike the other musicals discussed here, Fiddler is a Jewish story that purposely “sounds” Jewish; the characters are consciously given a Jewish dialect. Having demonstrated that Jewish lyricists tend to use the question form, it is interesting to view this libretto as a litmus test. The result does not come as any surprise: from the very opening words of the show, the Jewish question pattern we have come to know emerges. Harnick relies on the pattern of asking questions because it is an authentically Jewish mode. As in all strong opening numbers, this song introduces the themes, characters and attitudes of the entire show. As the next verses continue to introduce the papas, mamas, sons and daughters of Anatevka, significantly, they do so in series of questions. I don’t remember growing older. And tear out my beard and uncover my head. Tradition! They’re not even asking permission from the papa. What’s happening to the tradition? One little time I pulled out a thread. And where has it led? Where has it led? How can I hope to make you understand why I do what I do? Who could imagine I’d be wandering so far from the home I love? Yet, there with my love, I’m home. Intrinsic in the theme of question-asking is my argument that the Jewish composers and lyricists who pioneered the American musical stage did so from a place of marginalization. As immigrants or sons of immigrants, they had huge obstacles to overcome in understanding American ways. They were outsiders and were often pushed to the sidelines. Perhaps because of their status as unknowledgeable newcomers, or because the Jews were discriminated against in the new land as they were in the old, they sometimes adopted the language of weakness. Along with finding a land of opportunity and success, the immigrant Jews found that they entered a lion’s den of intolerance and discrimination upon their arrival in America. They often did not have the power or the confidence to use statements or commands. My earlier example of Tuptim shows how question-asking can reveal a powerlessness and a deep anxiety about being seen as wrong. In circumstances like these, asking a question is safer than making a definitive statement, and safety was a concern for the Jew. Jewish lyricist Yip Harburg once commented, “A song is the pulse of a nation’s heart, a fever chart of its health. Are we at peace? Are we in trouble? Do we feel beautiful? Are we violent? Listen to our songs.” Jewish-American composers and lyricists grew into adulthood knowing their roots as well as feeling the sting of discrimination in their own lives. Stemming from their shared experience, they each grew to translate into their creative work the positive and negative experiences they faced in the new world. Their nuanced Yiddish mother tongue, their painful brushes with anti-Semitism, and their rich Jewish heritage all combined to dictate the major themes of their musicals and, ultimately, led to creating a renaissance on the American musical theater stage.